News Page RVers & RVs in the news. RVing My Way - a place where those new to RV'ing can be introduced to methods that will work. Barb & Ron Hofmeister's Movinon Web Site Fulltimers and Authors of two books about Fulltiming. Two Penny Travels - Sam and Alice Penny have been Fulltime RVers for many Years and have posted lots of good info on their website. On the Road With Larry & Teddy Blog - Fulltime RVers, Traveling in a "Cardinal" 37 foot fifth wheel based near Traverse City, Michigan. RVeCafe.com - Dale & Gwen Prohaska recount thier outdoor activities, RV travel and care for their dog Morgan and cat, Annie. Malia's Miles - Malia Lane considers herself extremely blessed to be able to live the fulltime RVer lifestyle since starting in 2001. She says she has learned so much from fellow RVers and want's to continue the tradition by helping others through her website. Pampering Campers is our business. Even if it means serving their campfire to them on a silver platter! All Pro Water-Flow An innovative, totally new concept of cleaning holding tanks with high pressure water. AwesomeTools.com Unique and unusual tools & hardware not available in most stores. ModMyRV a great website that shows you how to make useful modifications to your RV. RV Roadside Assistance, Trailer Towing, ERS Offers emergency road services for motor homes. Good Sam ERS roadside assistant club is dedicated to providing the best RV towing and repair services. ExploreOutdoorsHQ.com - The ultimate camping checklist. RVTV Living on the road is more than a vacation, it is a way of life. With RVTV, life justs get better. Workers On Wheels Job related resources for RVers including information on the social and practical aspects of RVing. Plus, Coleen and Bob's travelogue about life as full-time RVers. The RV Home Page - Resource for recreational vehicle information including events calender, classified ads and links to other sites. Road Watch America Direct - Information on roadwork and conditions for the U.S.
RV Net Linx - Yet another source of RV-related information and links on the internet. RoadTrip America These are the adventures of Mark, Megan & Marvin the Road Dog. RV Hometown - Full time RVers & book authors, Stephanie & Paul Bernhagen have lots of info at their site. Everything About RVing - Whether you are new to RVing and camping or a veteran, Everything About RVing has something for you. A brief, ilistrated history of the motorhome. 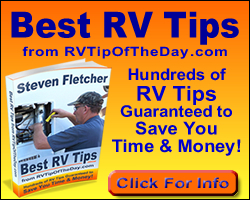 RV Tip of the Day Helpful RV tips that will save you time and money. RV Referral Network- Recondition your RV Refrigerator for less. Best warranty. Money Saving RV Repair - Robbie Warford and son Tucker are RV technicians in San Diego, California. RV Technical Help and How To Do - An extensive list of links to RV related web sites. RV Campgrounds in California Directory of California Travel Parks Association members. Includes directions and maps. Collins Lake Resort N. California. A great place for Boating, Fishing and Swimming. Many sites on the lake. Shiloh RV Resorts - RV Park - Memberships and Camping Information. Coast to Coast, Resort Parks International, Adventure Outdoor Resorts Memberships. Public Campers Welcome, Low Price Guarantee! Passport-America - The original 50% discount camping club has over 1372 participating campgrounds throughout the United States, Canada, and Mexico. Recreation USA - Camp For $10 a Day. A unique, quality system of RV Resorts, RV Parks, and Campgrounds. Travelhome RV Park N. California. A quiet, shady, oasis in the middle of town. The Lodge at Whitefish Lake: Whitefish Montana Resort Lodging Whitefish Montana offers year around family advertures such as skiing, boating and hiking and all of this can be enjoyed while staying at The Lodge at Whitefish Lake. Yosemite Pines RV Park and Campground - Offers full RV hookups, cabin rentals and tenting for an enjoyable Yosemite National Park camping experience. RV Camping Directory RV campground directory, RV campgrounds and RV parks reviews, recreational vehicle news. The California Delta - Delta folks refer to the roads and highways here as "asphalt sloughs." American Journeys features over 1,900 pages of free RV travel information covering the subjects RVers want to know--by state and city. Happy Camper Club - Camp at RV parks and Campgrounds for half price. The RV Club - An on-line RVers club. The sponsors RV-Talk a free e-mail based discussion group. Family Campers & RVers - FCRV is the largest member owned, non-profit RV organization in North America. Tattle-Trail - A wireless and portable towing monitor system designed to alert drivers to potential towing hazards. This technology continuously measures vibration on vehicles towed behind a truck, RV or motor home. D & M Flags - Rotating Flagpole displays the flag at a 45 degree angle & rotates with the wind like a weather vane. It's compact & portable making it ideal for the RV or camping enthusiast. The Wheel Wedge - An all terrain wheel chock. TUGS - Great Solutions Inc - Tugs is a patented bed sheet retaining system. It works wonderfully on RV mattresses, as well as many others. Your bottom sheet stays on tight and securely, all night- every night! Grillmeister Grills - Grills, fire-rings and accessories made of high quality stainless steel personalized for the owner. Windshield Covers - Gain Privacy and sun protection for your Pick-up Truck, SUV or Class C Motorhome. Extra heavy-duty vinyl snooze bonnet covers windshield and side windows. Magnetic fasteners for easy on/off with anti-theft tabs. Includes a storage pouch. Prest-O-Fit - Prest-O-Fit is your source for high-quality RV accessories including Sewer and Sanitation Products, Step Rugs, Patio Rugs and Interior Rugs. The RVecoFlow Store, specializing in point-of-entry RV Water Systems, a line of quality RV and Camping chairs, which come in many colors, and also tables, Picnicking blankets, baskets, and totes. RV Fire Poker - The last campfire poker you will ever need - Guaranteed! Smart Trailer USA - Offers custom RV trailers for the Mercedes Benz "smart fortwo" micro-car and the Toyota Prius. Tweetys RV Parts - Low prices everyday on lot's of cool RV parts and accessories. Universal RV Collision Repair - Authorized service center for many RV manufacturers and approved by Foremost Insurance Group. ECOsmarte Systems - Your RV water supply can be turned into a better-than-bottled water quality with the Ecosmarte RV Water Treatment System. Carport1 Carport1's Metal RV Carports are steel and therefore much more durable compared to fabric RV covers. Ameri-Camp - A top rated recreational vehicle manufacturing company in Indiana, locate an RV dealer in USA including Indiana & Florida to buy 5th wheel & travel trailer RV’s for sale. K & D Custom Coach - Manufacturer of custom Class A and Class C motorhomes and RV travel trailers and fifth wheels and handicapped accessible vehicles, police units, trailers, medical units and more. Keystone RV Center - Full service RV dealership offering sales, service, parts, rentals, storage, and campground all at one convenient location. We sell pop-ups to luxury diesel motorhomes. RV -n- Motorhomes RV Mobile homes and motorhomes from reputed RV trader specializes in new and used RV sales. AK Recreation A volume discount dealer specializing in NUWA- Hitchhiker fifth wheels and Jazz by Thor. Offering sales, parts and service for towable recreation vehicles. Stable-Lift Camper Lift System A safer alternative to the corner jacks for slide-in truck campers, also serves as a tie-down system. Stewart's RV - New & used RVs, trailers, motor homes, toy haulers. Brands include Outdoors RV, Forest River, Palomino, & more. NeXus RV A factory direct manufacturer of Class C and Class B+ Motorhomes. Want your link to appear on this page? Email us. Get current information about the RVing lifestyle, and the RV industry from your fellow RVers. You can also post your own questions. We never share your email address with anyone. Enter your email address here.